Presented by the RIH Foundation, join us for this free information session to learn more about Interior Health Home Health Services in Kamloops and how to access care in the community for you or a loved one. 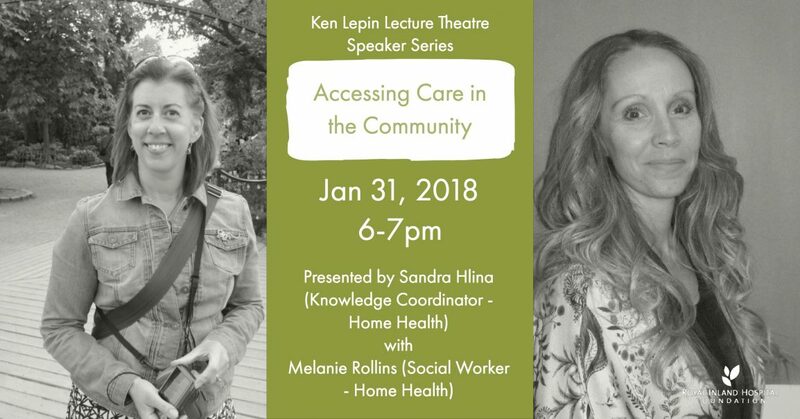 Featuring Sandra Hlina and Melanie Rollins from the Home Health Services team, Sandra and Melanie will explain program eligibility, the referral process, programs available and the cost of services. Wednesday, Jan 31, 2018, from 6 pm to 7 pm. Melanie is a Registered Social Worker and has been employed with Interior Health for the past 15 years. Melanie has worked in various capacities within the hospital and is now in the community working with the Home Health Nursing Teams. Melanie holds a Bachelor of Arts, a Bachelor of Social Work and is an Adult Protection Specialist and Qualified Health Care Professional. Melanie’s expertise is working with vulnerable adults and their families and performing complex assessments. Melanie is currently working on furthering her education in the field of Gerontology and the study of Health Care systems. Sandra is the Operational Knowledge Coordinator for Home Health in IH West. She graduated from TRU in 1998. She spent almost two years working in the acute rural hospital in Salmon Arm and then came to work in Home Health in Kamloops in 1999. She has spent the rest of her career in Home Health in a variety of program roles including Intake, Quick Response, Community Clinic, Case Management, home care nursing, assistant manager and has been the educator since 2009. She is a certified CVAA nurse (Canadian Vascular Access Association) and completed her Masters of Nursing Degree from UBC in 2014.